The incredible Bellagio Conservatory & Botanical Gardens in Las Vegas is welcoming Spring’s arrival with an amazing display of Japanese culture. Discover the diverse culture of Japan, often called the Land of the Rising Sun with an exhibit featuring greater than 82,000 flowers and floral creations that are truly larger-than-life! This Japanese Garden display at the Conservatory & Botanical Gardens is the first one that is Japanese inspired. There are two beautiful exhibits in total that focus on Japan’s culture covering art and nature. The display consist of fresh tulips, daffodils and snapdragons. Located in the West Garden of the Bellagio Las Vegas resort, you’ll find a sacred scene that features a Japanese temple towering 26-foot-tall. The temple was inspired by Kyoto’s famous Golden Temple. Residing on a shore next to peaceful waters, the gorgeous Japanese temple is decorated in gold veneer and wood frames with traditional rice paper Shoji screens. On golden sand in the South Garden of Conservatory & Botanical Gardens, see a traditional Japanese-inspired tea house. This tea house was custom built utilizing bamboo pieces, mineral copper accents and natural logs. Standing 12 feet high, the tea house celebrates the time honored, ancient tradition of drinking tea in Japan. Near the tea house on the North Bed, view a lush, hanging garden of both Bougainvillea and Wisteria. Below the garden is abstract stone art that represent various icons of Japanese cultural. Examples are Mount Fuji, the turtle and crane. Illuminating the beautiful and colorful garden are stone lanterns that provide the ideal ambiance. Found in East Garden is a tremendous 18-foot high cherry blossom tree. This tree is decorated with 300 acrylic blossoms and leaves. At the cherry blossom tree’s base, is a soothing pond stocked with 75 Koi fish. The pond is replenished by a cascading tsukubai waterfall from flows from a height of 16 feet. Two ornate floral topiaries are comprised of 15,000 fresh-cut flowers: the first is a six foot majestic crane and the second a seven foot long turtle. The animals are protected by 35 amazing hand-painted parasols hanging from above. The Conservatory display is the result of efforts between between the expert horticulture team at the Bellagio, MGM Resorts International Event Productions, plus consultation from Master Gardener Kanji Nomura from Nagoya. 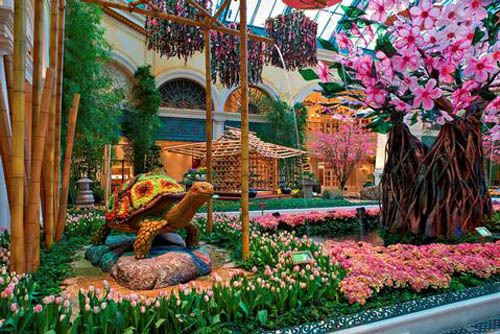 Bellagio’s Conservatory & Botanical Gardens is open to the public daily, 24 hours a day and admission is free. Between the hours of 4:30 pm and 6 pm each day, live musicians will perform a variety of Japanese melodies on a floating platform. The Japanese Garden display will be available at Bellagio’s Conservatory & Botanical Gardens now until May 11. Golden Week is a national celebration in Japan that recognizes several significant holidays in Japanese culture, such as Constitution Day, Greenery Day plus Children’s Day. To plan your next vacation to Las Vegas and stay at the Bellagio Las Vegas, allow us to help plan and book your reservations. Be sure to visit the new Japanese Garden display at the Conservatory & Botanical Gardens. Return to read about other luxury travel destinations by following this luxury blog.